Just to give you a bit of background, Little Debbie is a brand of McKee Foods, the company also responsible for the Sunbelt Oats & Honey Chewy Granola Bar (a treat so sweet and scrumptious, it shouldn’t even be called a granola bar). But it’s Little Debbie who’s the shining star of the McKee Foods family: she’s kept sugar lovers happy through multiple wars (including the war on trans fat, though I have a feeling some of her products still have it) and, unless the U.S. decides to crack down on products that spread happiness, I’m pretty sure she’ll be around for awhile. There was a time in my life where I didn’t like chocolate. I actually hated it. And I remember eating one of these brownies back then and feeling sick to my stomach. Now the only thing that sickens me is the thought that these classic brownies might someday disappear. From the density to the texture to the fudgy-nutty top, you can’t go wrong! I dare you to cut one of these rolls in half , look at it, and not be tempted to eat it. Seriously, just try. I bet you can’t. You know why? Strawberry Shortcake Rolls may be the most beautiful pre-packaged snack on earth. They’re freaking gorgeous. My mom didn’t like me eating them (they’re BEYOND sweet), but I think she let me do it because she knew how much I loved the way they looked. That said, I have to say that Zebra Cakes — the way they look and the way I imagine they taste — are up there with the best of them. As I mentioned, I used to hate chocolate, and so the idea of something completely vanilla-based really appealed to me. I can’t think of too many other baked goods that really capitalize on vanilla that way. Anyway, thank you Little Debbie for continuing to churn out products that make us happy. 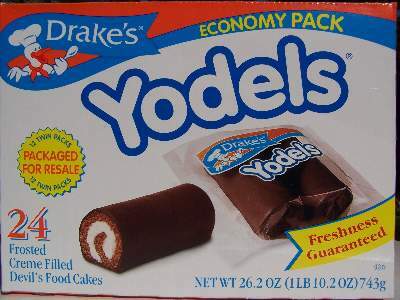 I will always choose Yodels before Swiss Rolls (another confession), but I appreciate what you’ve done in the snack world and hold you in the highest esteem. All photos courtesy the Little Debbie website. those brownies are fantabulous. a perfect brown lunch dessert in the 5th grade. Little Debbie was right up there with Ralston Brands cereals as the de facto runner-up brands at the camp I went to as a kid. We primarily used to switch between the FUDGE SWIRLS and the MARSHMELLOW PIES. The MARHSMELLOW PIES were right there among the best representations of these treats. The FUDGE SWIRLS always left me a little dry, though. When devil’s food (chocolate cakes) aren’t done well in snack form, they have a tendency to be kinda dry, which is what I found here. But regardlesss, Little Debbie has a special place in my heart for bringing be back to the halcyon days of my youth! TL;DR; but you have great images.